Bultaco motorcycle books cover the history and various Bultaco models with several owner's manuals. Bultaco were a Spanish manufacturer of two-stroke motorcycles from 1958 to 1983. Bultaco Limited Edition Extra 1964-1970 by R M Clarke (2006). A portfolio of 31 contemporary articles traces the progress of Bultaco production in the 60s. Included are road, trail and track tests, new model reports plus articles on Bultaco's history and racing. 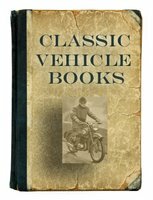 Bultaco Limited Edition Extra 1971-1979 by R M Clarke (2006) contains thirty articles, taking the story of the marque up to the end of the seventies. Included are road, track and enduro tests, driving impressions plus full specifications and performance data. Models reported on include the Lobito, El Montadero, Sherpa T, Matador, Tiron, Alpina, Pursang, Astro and Frontera. Bultaco Competition Bikes Owner's Workshop Manual 1972 - 1975 by Jeff Clew (1979) covers Alpina, Frontera, Pursang & Sherpa T models from 1972.